Colorful flowers enhance many types of landscape designs. Hanging bags provide an interesting alternative to baskets and containers. These plastic bags provide ample space for soil and maturing roots. Small slits allow room for emerging plants. Several types of flowers thrive in the moist environment within these sturdy bags. Like other types of hanging containers, these bags enhance porches, patios and entryways. Place some hanging flower bags near your entryways to welcome visitors to your home. Annual vinca plants (Catharanthus roseus) produce small blossoms in shades of red, purple and white. These blossoms appear on short stems between the early weeks of summer and the first frost of the season. This flowering plant requires large amounts of sunlight. 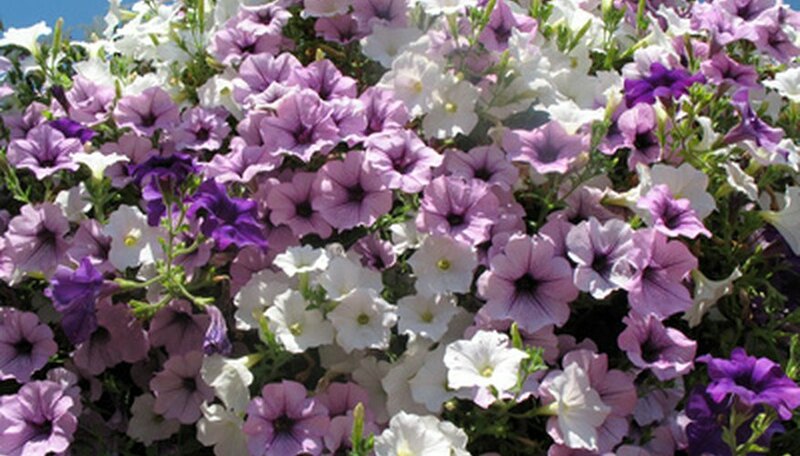 Annual vinca plants grow to a height between 6 and 24 inches, making them a suitable selection for hanging bags. A common type of houseplant, geraniums (Pelargonium x hortorum) thrive in hanging containers. These container plants grow approximately 12 to 36 inches tall. They produce red, white, and pink blossoms all summer long. Hanging bags allow plenty of space for these plants to mature. Many types of geraniums grow as wide as they grow tall. They require full sunlight for optimum growth. Many types of vines thrive in elevated containers, such as hanging bags. Sweet peas ( Lathyrus odoratus), like many flowering vines, grow well along garden fences and supporting structures. They also make an interesting, trailing variety of flower in hanging bags. The long sections of these vines reach approximately 6 feet and produce fragrant, colorful blossoms throughout the summer months. Sweet peas require protection from hot, intense sunlight and prefer filtered sunlight. Purple shamrocks (Oxalis purpurea) blossom in shades of white and pink. The foliage of these plants enhances hanging bags with their rounded, purple leaves. This plant reaches a mature size around 10 inches tall and 10 inches wide. It prefers slightly shady locations. Fuchsias (Fuchsia cultivars) produce stunning blossoms on trailing stems. Commonly grown in containers, fuchsias thrive in moist, well-drained soils. These plants display attractive, colorful flowers in shades of red, coral, white and purple during the spring and summer. Keep this plant out of direct sunlight and protect from heat and wind.